This year the Coventry Half-Marathon was arranged at very short notice when the original organisers pulled out. 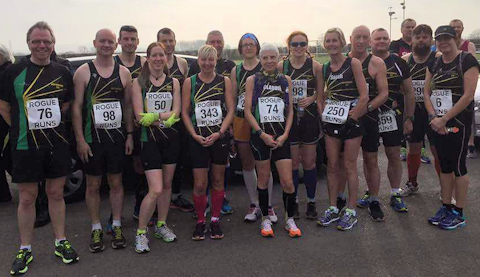 Northbrook AC and other local clubs were approached for help and Dave Long, a Coventry running legend who ran in the Barcelona Olympics marathon, was very pleased with our response. The Northbrook zone was in the rural parts of the course including Washbrook Lane, Bridle Brook Lane, Wall Hill Road, Hollyfast Lane, Tamworth Road and Long Lane, between miles 5 and 9. At short notice, and despite other races on the day, Northbrook were able to provide very enthusiastic support along the route. The Northbrook colours were well-displayed, and every competitor will have noticed our presence. It was great to raise the profile of the club, and thanks to everyone who helped on the day. It was an early start for this scenic 20 miler somewhere down towards Bristol. What a fantastic Northbrook turnout it was this year for what is essentially a low-key race. It’s always a small field of entrants so registering early is always a bonus but, although the field maybe small, the enthusiasm of the marshals dotted around the course wasn’t. It’s basically a two-lap route around some very pretty villages, all of which seem to circle an enormous hill (which luckily wedid not have to climb). Quiet country roads with very little traffic made the run quite pleasant. However, the heat took us all by surprise and those who opted for vests and shorts (rather than base layers, thermals, fleeces or duffle coats) fared somewhat better. A few PB’s were bagged by some, others were experiencing their first 20 mile race. Some were injured but managed to get to the finish line. and unfortunately a couple of our runners had to pull out during the race due to specific injuries (a tough call but a wise decision). The finish was within the grounds of the small leisure centre and am pleased to say that Tommy (who led the Northbrook posse round), made it back just as the bar was opening. Most of us others opted for the free coffee and the home-made cakes, although I did spot a few other pint glasses littering our tables – and why not.